ProToolZone is reviewing latest Power & Handtool products in various categories, helping consumers to find the best product which can cover all of their home improvement needs. We acknowledge the impact of the written word both online and offline and would like to assist those creative minds in exhibiting their abilities in this area. 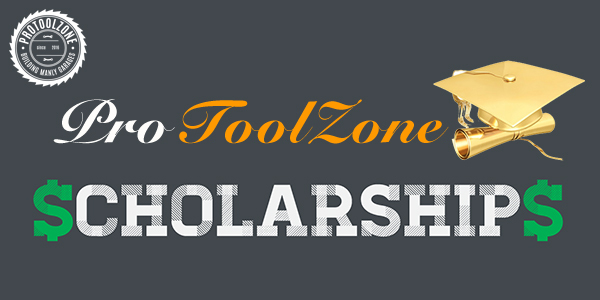 We designed the ProToolZone Internet Marketing Scholarship for Undergraduate or Postgraduate students with the passion of “Internet Marketing” to receive a $1000 award. For the students that currently are studying in the fields of Marketing, IT, Communications, or Business will be exceedingly fascinated in this scholarship program, and one doesn’t need any expertise in this area, by having the passion for internet marketing content creation is enough. We would like to know what makes you stand out from the rest of the potential candidates by sharing with us your best and unique personality. Applicants should submit their 3,000 word minimum “top 10 list” on any home improvement tool, appliance, etc. Look through anyone of our pages for ideas. Your article will be made considered on the level of uniqueness and imagination, and especially the written content. We would also like to understand why you are pursuing an education in your field and why you are interested towards our scholarship. *Only one winner will be selected. This is a yearly Scholarship program, so check back each year. The winner’s name, school, and article will be posted on this page. Winners will be contacted over email & scholarship awards will be sent through checks. Checks will be sent to the Financial aid department of the college under the winner student’s account.